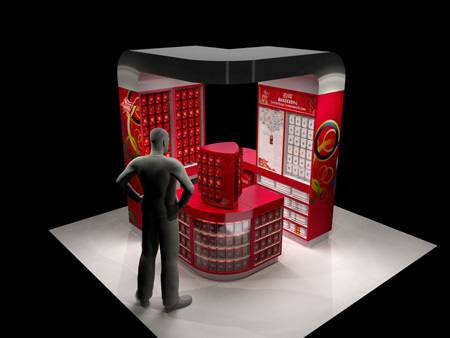 My third project with coke involves designing a custom Kiosk system for their Olympic Pin Trading program in Beijing. Where have I been all these years? Apparently Pin Trading is not something I am familiar with! 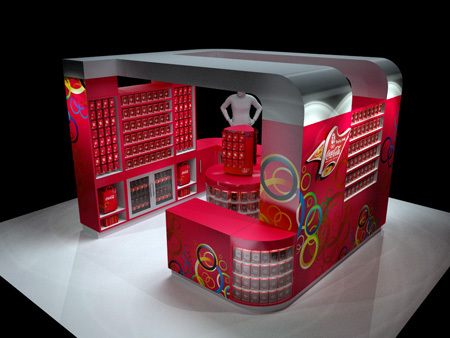 An agency in China developed a number of concepts for this project which Coke considered too young and child like, so I was to start from scratch with limited direction on where to take the look. The graphics used in the program where developed earlier for the Olympics, so my primary job was to design out a modular fixture system which could be utilized within many different venues. I was tasked with 3 sizes of Kiosk based on square footage. The graphics I was provided incorporate a lot of rings. Obviously pulling inspiration from the Olympics. With that in mind, and considering that Coke is the “catch the wave” brand, my initial instinct was to design some fairly curvy and flowing fixtures. Getting curves to fit together isn’t the easiest thing to do, especially when you are building for modular use, so in the end I decided on a simple, minimalist use of half rings. So each counter had was a half ring shape, or quarter ring shape. 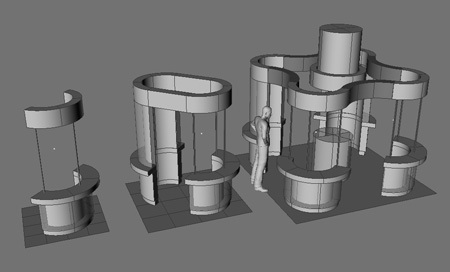 This allows you to create round kiosks as well as wavy kiosks and anything in between. You can have stacking fixtures, which rotate around a common axis, as well as matching overhangs and headers. I was pretty happy with these initial ideas, but after presenting to my contact at Coke, I found out they wanted a more boxy system. Something more square and with a hint of rounding. Round 2 hit the mark, and below are some resulting renderings. This entry was posted	on Friday, December 12th, 2008 at 12:08 pm	and is filed under Design. You can follow any responses to this entry through the RSS 2.0 feed. You can leave a response, or trackback from your own site.